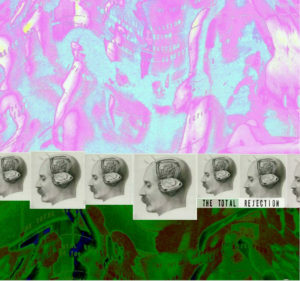 The Total Rejection are from Bristol and are ‘just playing music that we like the sound of. we know exactly what’s what and who the enemy are’. Released on Raving Pop Blast! their debut album has the best title of a release we’ve seen this year – Wrapping Yourself In Silver Foil Won’t Save You From The Blast. Read what we thought below. I caught this record because I bought something and followed someone on Facebook and have been reading about it for what seems like a year in dispatches from the Garage Front. I bought it on the strength of that writing and just as I used to do when I read the inky music press weekly, I bought it because it sounded cool, even when I hadn’t heard a note. When’s the last time you did that? If it’s been a while, do it today, get to a record shop or online on Bandcamp and do some reading, then buy something. We used to. All the bloody time. Anyway. The Total Rejection. The sleeve looks like it’s been handmade, probably because it has, the record is green and sounds bloody great. It’s garage punk straight out of the psychedelic pop jungle and spaced out with tunes. The feel is of right now this second echoing back to the feeling you got the first time your mates played you the Stooges or Jesus and Mary Chain. It’s not ground breaking but it’s got the edge that music needs, the raw centre that makes the notes bleed out and sucker punch you, it’s for dancing stupidly in smoke filled rooms, for shouting abuse at the stage as the band thrash out the fuzzed up goodness, it’s a bloody treat, that’s what it is. I love the fact that there isn’t a track list on the record, you have to find it on the papers inside. I love the fact that the groove it has could be anytime and place, I love the fact that this record stands proud next to anything I’ve bought in the last couple of years. It’s a great record. So listen to the video and get on it. They’re already saying that the second album’s better than this one. Can’t wait. The Total Rejection can be found on Facebook, you can buy the album on the Raving Pop Blast! Bandcamp page. Best LP I’ve heard in ages. If you like this and Charlie tipper you may want to try this…. Out on raving Pop Blast! And by a Charlie tipper person….